October 18, 2018 update: Take Facebook 3D photos with Qoocam! July 28, 2018 – first impressions, hands-on report and new 360 video samples! 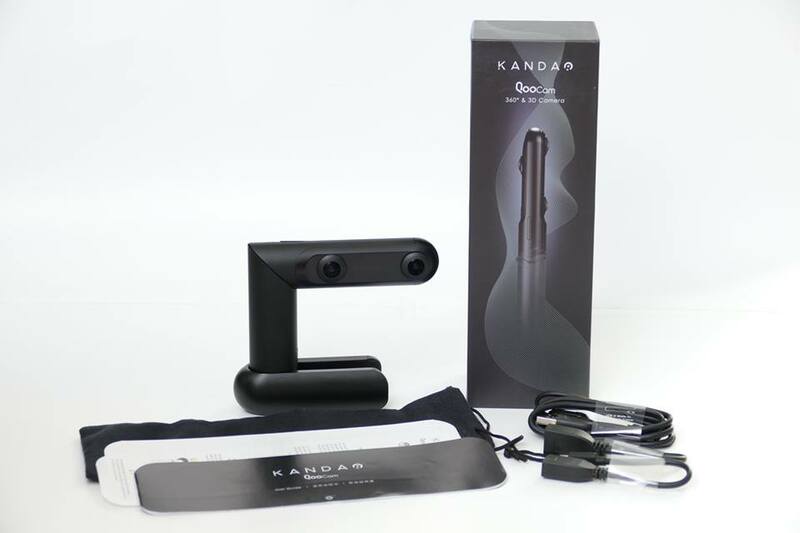 Kandao Qoocam is a camera with three lenses, and can be used either as a 360 camera or as a 3D camera. It has a unique swiveling body. When the camera is vertical, it uses two fisheye lenses on opposite sides to capture 360 images (presumably both photo and video). In 3D mode, the camera lenses can swivel to horizontal position to use two fisheye lenses on the same side. The third lens for 3D mode is identical to the other two lenses, therefore the 3D mode is hemispherical (not just ultra wide angle). Note that the table states that the battery life is 180 minutes. That refers to continuous recording and I can confirm that it is accurate (see below). 1. Class-leading endurance (updated: September 4, 2018) for both battery life and resistance to overheating. Using a Sandisk Ultra 128GB Micro SD card, I was able to record for 3 hours 26 minutes continuously in 4K. At that point, the camera battery ran out although there was still space on the card. This is the longest I’ve been able to record on any 360 camera using the internal battery. I conducted the test indoors in 78F temperature, without air conditioning or a fan. 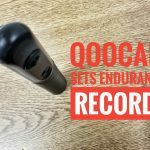 Kandao Qoocam records for over 206 mins. 2. Image stabilization. Qoocam has excellent built-in image stabilization. The stabilization performance is so good that it may overtake Rylo as best-in-class (I plan to do further tests). Not only that but it will have two stabilization modes: standard stabilization and forward-facing stabilization (as of April 2018, only three other 360 cameras have forward-facing stabilization: Rylo, GoPro Fusion, and Garmin Virb 360). 4. Depth mapping. 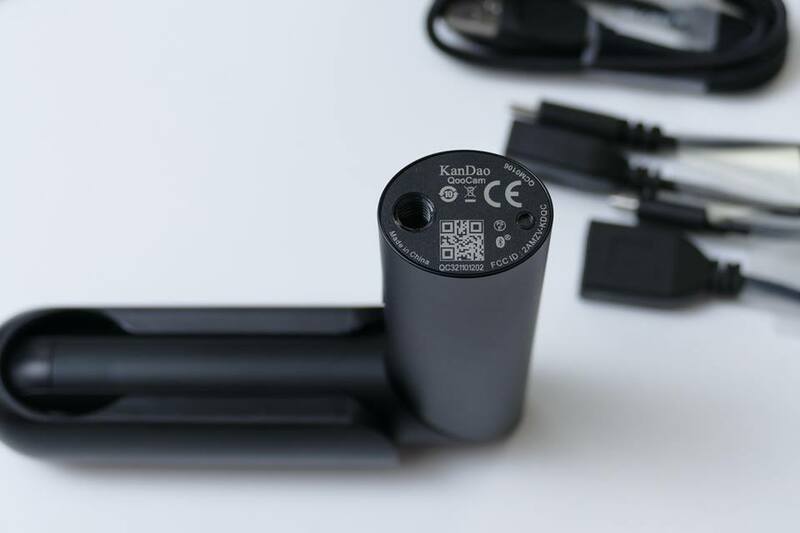 Qoocam has technology developed from the Kandao Obsidian that enables it to use its 3D camera to create a depth map, which can be used in several ways such as replacing the background, or refocusing the camera after the fact. These capabilities make it useful not just for 3D afficionados but even for casual users. 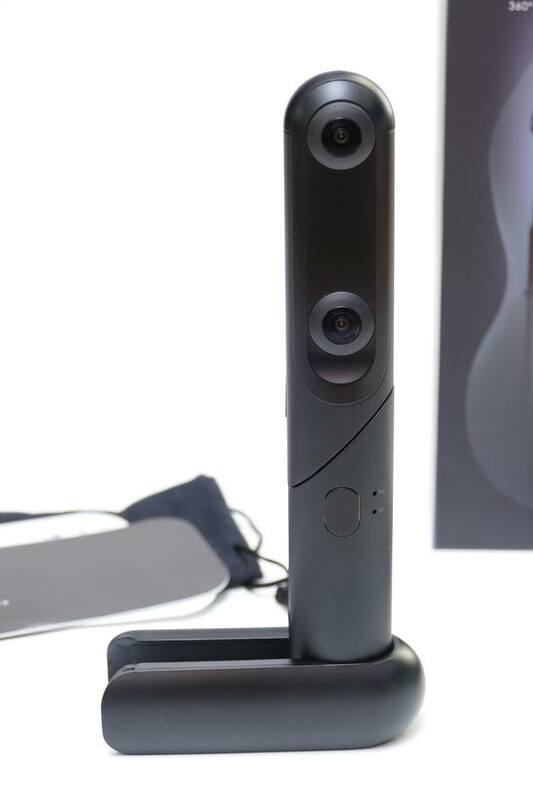 It is the first consumer 360 camera to offer depth mapping. In the future, Qoocam will enable you to change backgrounds, thanks to its depth mapping technology. See below for a tutorial. Qoocam will also use its depth map for Facebook 3D photos. 5. Shoot first, focus later. Qoocam is the first consumer 360 camera to allow you to change the focus from the subject to the background and vice-versa. 6. DNG Raw image stacking. Qoocam can shoot a DNG Raw burst of 8 shots. Moreover, Kandao’s Raw+ software will be able to stack up to 16 images to reduce noise. Kandao also states that this will improve dynamic range as well. Unlike conventional image stacking (e.g. Photoshop), Raw+ is able to stack images even with moving subjects, or even use a handheld burst. Here is how to use the DNG8 mode. 7. Live streaming. It will be able to live stream both via USB and via Wi-Fi (by connecting to your phone). 8. Tap and direct. On the app, you can create smooth panning movements via keyframing, with an intuitive touch-based interface. 9. Smart tracking. It can track subjects and keep the camera facing the subject’s direction. 10. Time lapse. As a 360 camera, it can create 360-degree timelapse, or a conventional non-360 timelapse with panning movement. Alternatively, in 3D 180 mode, it can create a 3D 180 timelapse. Available now for iOS and Android. Note: previously, Kandao stated that Qoocam would have realtime optical flow stitching, but that doesn’t appear to be the case as of July 2018. 1. Long exposure mode. Previously, shutter speed was limited to 1 second. With firmware 63, the shutter speed can be as slow as 60 seconds, slow enough for night sky photography. Combined with Qoocam’s DNG8 mode, this should allow for pretty clean night sky photos. 2. Easier 3D photos. Kandao has now made it easier to create Facebook 3D photos. Among the sharing options in the app, users can now see a “3D Photo” option. The photo will then be uploaded to Qoocam’s cloud service where the photo will be posted to the Qoocam ThreeDphoto account on Facebook after a day or so. There is also a new method that doesn’t require posting your photo to Kandao’s Facebook page. 3. Smart Track. Qoocam is now capable of improved object tracking. The video can automatically pan to keep aiming at the chosen object. 4. Slow motion playback. Videos that were shot at 60fps will now be played at 30fps to create a half-speed slow motion effect. 5. Hyperlapse. A hyperlapse effect can be applied to videos, up to 8x speed. As a 360 camera, the Qoocam appears capable, with 4K resolution and simple controls. Users can also switch to the front-facing 3D 180 mode, which I think is especially ideal for beginners. I have the LucidCam hemispherical 3D camera and I enjoyed shooting with it. Among other things, composition was much easier than with a 360 camera, and far easier than with a 3D 360 camera (which is even more challenging for composition). 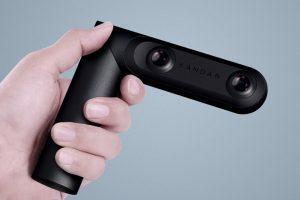 Kandao will update the Qoocam software to enable it to take Facebook 3D photos as well, using its depth map technology. Here is a sample Facebook 3D photo shot with the Qoocam (please allow time for the photo to load in full). 1. Open a VR180 photo in Qoocam Studio. 2. For the projection type, choose perspective (rectilinear). 3. In the rendering tab, choose Mono (not Stereo), and check the box for “Output with Depth.” When you render the file, you will have a 2D photo and a depth map. 4. Open the depth map and save it as JPG instead of PNG. Also rename it to the same exact name as the 2D photo but add “_depth” at the end of the filename. For example test3D.jpg is the main file, while test3D_depth.jpg is the depth map. 5. Create a new post on Facebook and ppload both the photo and depth map. Facebook will convert your photo into a 3D photo. Qoocam now features SmartClip, which is a way of creating overcapture or tiny planet animations quickly and automatically, with no editing required. It works by offering pre-made templates which show the user the final effect. Each template also includes instructions for shooting the video. 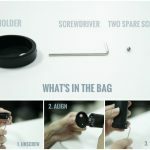 After following the simple shooting instructions and applying the template, the user can get an overcapture or tiny planet video with no experience required. The Qoocam is solidly built. It feels heavier than what you would expect and feels like the outer shell might be made of metal. There are nice details such as the concentric rings on the power button, and the subtly embossed black-on-black Kandao logo. One issue with the design is that it’s very hard to open the rubber covers for the Micro SD card and USB port, if you have short fingernails. I’ve resorted to using the Micro SD card to pry the rubber doors open. Another possible issue is that the 1/4-20 tripod hole is off-center. There is a slight possibility that Qoocam could twist from its own weight and eventually get unscrewed. You probably should check every now and then. 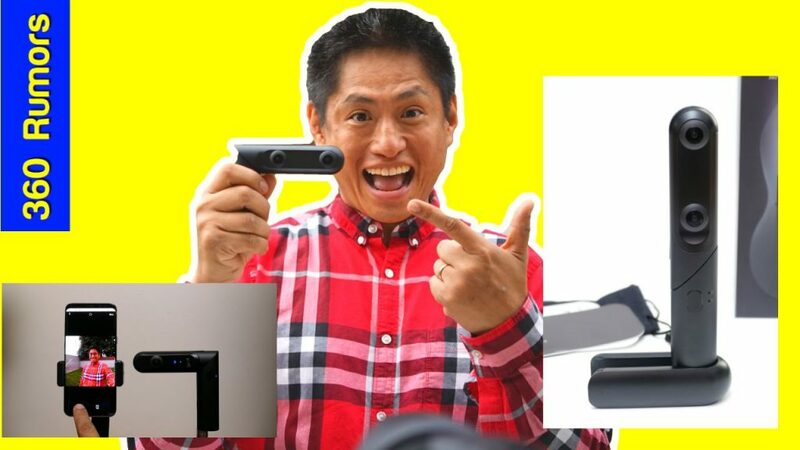 Here’s a video that discusses why the Qoocam is incredible, and what is the benefit of having both 360 and VR180 in one camera. I also show an unboxing video, plus a tutorial for shooting with or without the app. Finally, I answer 21 questions from 360 Rumors readers and viewers. Desktop app QooCam Studio for Windows now available for download. You can try Qoocam Studio yourself with these sample files (for personal, non-commercial, private use only). 02:29 Unboxing; what’s inside the box? – Note: the default wi-fi password is 12345678. For iOS, you connect to the Qoocam’s Wi-Fi the same way you connect with a Wi-Fi network (go to your phone Wi-Fi settings). For Android, the app can connect to the Wi-Fi without having to enter the password. Sharing photos and videos: to enable the photos and videos to be shared on Facebook and Youtube, I recommend using equirectangular projection, and for 3D 180 photos and videos, use top-bottom (3DV) instead of side-by-side (3DH) format. Veer can accommodate both 360 and 3D 180 photos and videos, whether in top-bottom or side-by-side, and it’s free. Firmware 1.4 is a major update that adds a self-timer and manual exposure settings. The self-timer works only in photo mode, and can be set from 0, 2, 5, or 10 seconds. The self-timer setting is ‘sticky’ and will be retained even after the camera is power cycled. This means you can use it even without the app. With the self-timer, you’ll have time to move your hand or yourself away from the camera before taking the photo. The manual exposure works only in photo mode. With it you can choose ISO from 100 to 3200 in one stop increments. Shutter speed can be from 60 sec. to 1/4000, also in 1 stop increments (firmware 63 extended the shutter speed to 60 seconds). The exposure settings are not “sticky.” They work only while the camera is connected to the app. Here are sample photos from Qoocam in both 360 and 3D 180, and an analysis of their image quality. You can download both stitched and unstitched sample photos and videos here (only for personal, non-commercial, private use). The video shows very good dynamic range, and excellent stabilization. In the video from the prototype, there is a waviness in the stitch line. But in the release version, the waviness has been all but eliminated, as shown in the second sample above, and as reflected in my own tests (more samples TBA). 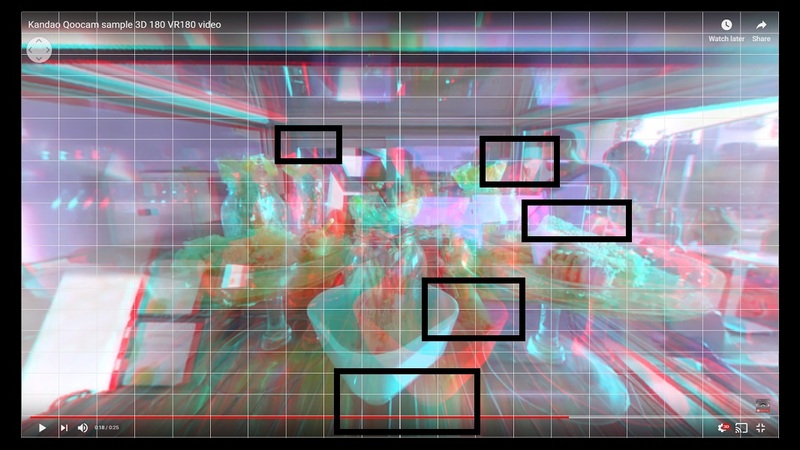 Note that the 3D 180 video is offset from the center. This was intentional. Kandao engineers reasoned that for a 180 photo or video displayed as 360, the user might want to put their logo or some other illustration to fill the black background. To make it easier to do so, they placed the image on the left side of the equirectangular frame rather than in the middle. This way, the logo would not have to be split between the left edge and the right edge of the equirectangular frame. I also tested whether the lenses are synchronized in 3D 180 videos. I shot a 3D 180 video with a very bright studio light to force the Qoocam to shoot at a high shutter speed. I then popped a flash several times (with approximate flash duration of around 1/1600 according to DP Review). On each flash, both lenses caught the flash at the same position (only a part of the flash is visible due to the rolling shutter). This proves that the left and right lenses are completely synchronized. I also checked for stereo alignment. 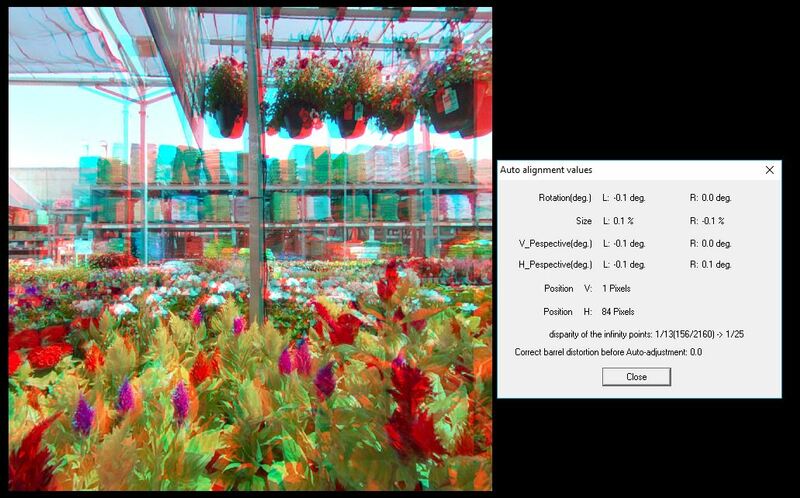 The video appears to have very good stereo alignment, as you can see in this anaglyph, which shows very little vertical disparity throughout the frame. 3. 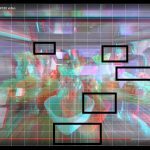 Here is a sample 360 photo and 3D 180 / VR180 photos, showing very good dynamic range and minimal chromatic aberration. The stitching is excellent. It is sharp throughout the frame except there’s a bit of blurring at the stitch line. However, the resolution is limited (for 360 photos, up to 4320 x 2160). For the 3D 180 photos, you can see it in 3D by clicking on the Cardboard icon on the bottom right. The image looks sharp, with pleasant, natural-looking colors and white balance, and a good 3D effect. In the album above, you can see a 3D 180 photo with refocusing effect applied. You can see that the refocusing effect isn’t completely accurate but works reasonably well. – 360 videos can be stitched in full resolution with optical flow stitching, and with stabilization. – You can now export 360 or 3D 180 photos or videos either in 360 or 3D respectively. The exported photos and videos will appear in your phone’s Gallery / Camera Roll. In addition, there are automatic presets for Facebook, YouTube, Veer and other apps. With version 1.3, the Qoocam app makes a purely mobile workflow possible. As of September 4, 2018, version 1.3 is available only for Android, but the iOS version will be available soon. The desktop stitching software is now available for Windows and Mac. The first part of the tutorial shows 5 2.5D animation effects, including 6DOF animation, that you can achieve with After Effects and an add-on called Volumax. 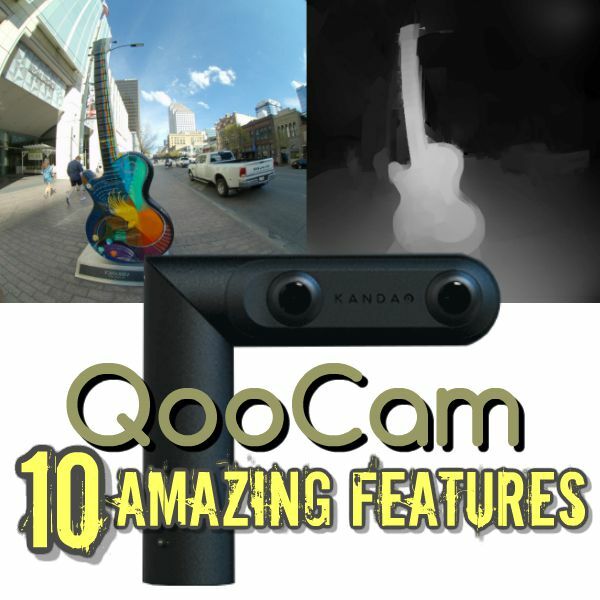 The second part is a tutorial for using the Kandao Qoocam to generate a depth map instantly using the Qoocam Studio software. In the video, I also discuss different ways to render the photos and videos from the Qoocam, including why I believe you should NOT render videos (or photos) in Google VR180 format. 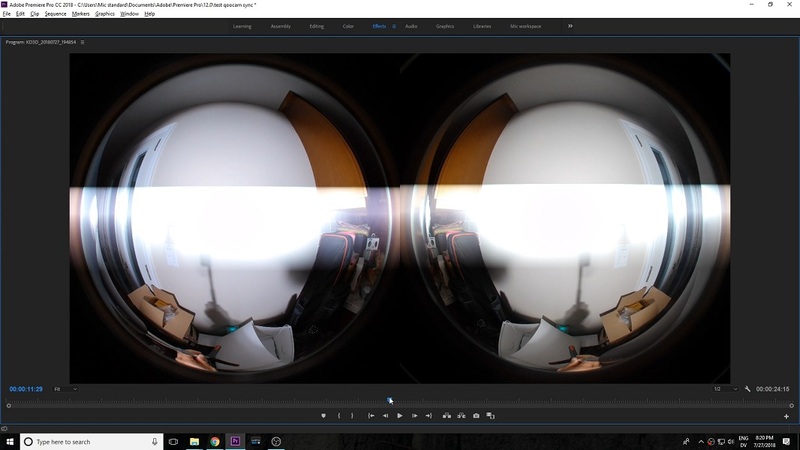 Briefly: Google VR180 is difficult to edit. Even Google’s own Google Photos app cannot correctly edit VR180 photos. As for videos, Google created a metadata injector tool, but only for Mac and Linux. Finally, even with the correct metadata, not all headsets can view VR180 in 3D 180 format. Essentially, you need a native Youtube app to view VR180, which means it can be viewed on Google Cardboard, Google Daydream, Samsung Gear VR, Playstation VR and HTC Vive. However, Oculus Rift and Oculus Go do not have native Youtube apps and cannot view VR180 in 3D. For these reasons, I instead recommend stitching photos and videos as equirectangular top-bottom photos for maximum compatibility with 360 sharing platforms and VR headsets. You’ll be able to view, edit, merge, and share Qoocam 360 and 3D 180 photos and videos painlessly. One of the most important features of the Qoocam is its ability to take a raw burst, and have the raw burst stacked to decrease noise. Because of Kandao’s special processing, it is possible to do this even when there is movement in the scene, or even if the shots are taken handheld. Here’s how to use this feature. – Qoocam smartphone app: the only way to use DNG8 is to shoot with the app. – Kandao Raw+ (download here): this software stacks the photos shot in DNG8 mode. – DNG Converter v11 (download here): this is required for Raw+ to work. If Raw+ is crashing while processing, you probably need to install DNG Converter v11. – Qoocam Studio: this is the desktop software for Qoocam and is used for stitching the stacked DNG8 photo. – Your preferred DNG editor. If you don’t have one yet, I recommend Affinity Photo, which is not only much more affordable than Photoshop, but also has better 360 image editing features. 2. Use the app to switch to DNG8 mode and take a photo. The Qoocam will shoot an 8-shot DNG Raw burst (it takes around 10 seconds to do this). Note: this is solely Raw, not JPG+Raw, so you won’t be able to view the DNG photos in the app at all. 3. Transfer the files to your hard drive (each burst will have a suffix that ends in 001 to 008). Launch the Raw+ app and open the DNG8 shots. Open only one burst at a time. Note: Raw+ can stack up to 16 photos at a time. 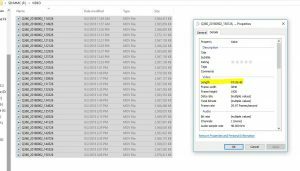 Specify the file save location and click on render. 4. Open the stacked DNG file in your DNG editor and after making the edits, save the file as a JPG file. Use the exact same file name (except that the file extension will be JPG instead of DNG). 5. Open the JPG file in Qoocam Studio, and either add it to the queue and click on render to stitch immediately. Some units have a defective base as first reported by reader Scott Pooler (he shared these photos from his unit). In some units, the base can be pried off due to a weak mount. 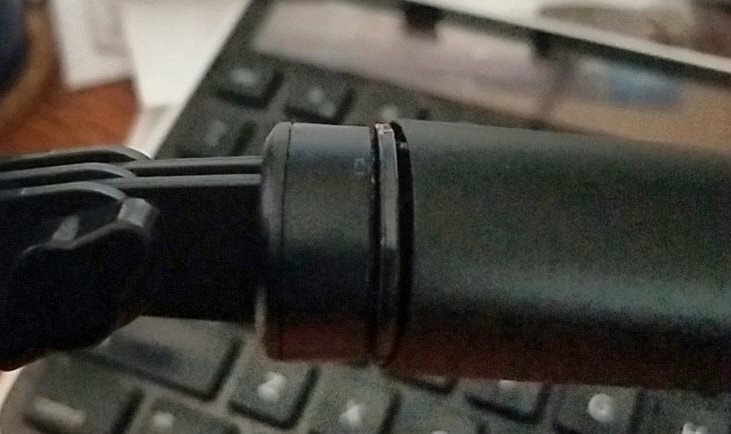 If you attach the camera to a selfie stick or monopod, the base will break off with normal use in these defective units. Kandao’s CEO tested random units and confirmed that a small percentage have this defect. He has promised to replace defective units, including those that were damaged when they fell down. 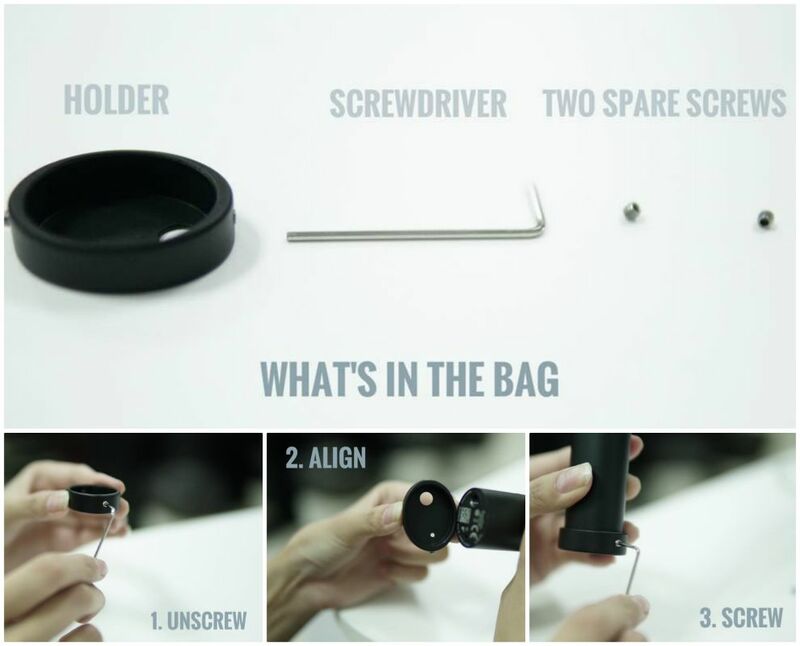 Kandao is sending out a repair kit to crowdfunding backers. It will attach to the bottom of the camera and hold the base securely. Kandao Qoocam is the most feature-packed 360 camera for consumers, with incredibly innovative features that should be very useful for users of all levels. 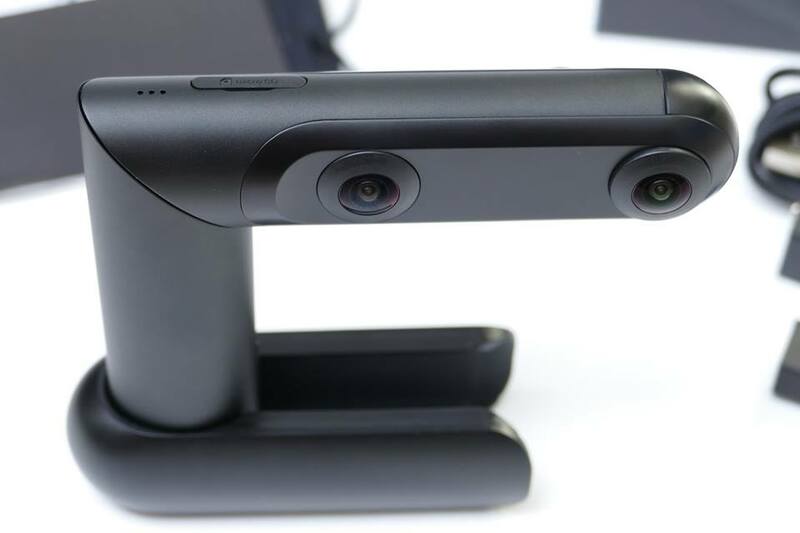 It has incredible stabilization, good image quality for videos, and is one of the first consumer cameras to be able to convert from a 360 camera to a 3D 180 camera. You can get 5% discount off the Qoocam using this link. I will continue to update this page, so please bookmark it if you’re interested, and please let me know if you have any questions. Check out Kandao’s fascinating minisite at qoocam.kandaovr.com and please join the Facebook VR180 group. There is also a Facebook group for Qoocam. This reminds me of the TwoEyes VR camera that has four lenses – two on each side – for a 3D 360 capture (of sorts). there is a small distance between the front and back lenses too… i’m waiting for it. They went through several design changes and now are trying to upgrade the electronics according to a recent post on Indiegogo. Their new delivery date is now November 2018 and they are probably not going to meet it. Anyhow, the big problem is the design and quality of this camera. Their video samples revealed a lack of sync between left and right images, poor video quality and poor audio. I don’t know how much better the final product will be, but it will be competing against VR180 cameras that seem to perform much better. Maybe it can do 3D 360° in the same way that I have been experimenting in creating full 360 in stereo with one Theta S – not just front and back, but to the sides as well. It would be a manual process for photos only, rotate it 90° taking four photos altogether. The lens close to the pole looks like it might be offset 3.25cm (half the distance of the two lenses/half the IPD). Your mention of the LucidCam reminded me. What ever happened to all the VR180 cameras that were supposed to be out by the end of the year? Yes i’ve been waiting for those too! they only said “winter” so it could be anywhere from now until april 2018. Backer #1. I was refreshing form 9AM on. I’m very excited to see this make it to the finish line – hopefully before a vacation I’ve got planned in December (I never truly trust the delivery dates on Kickstarter). Yes hopefully they deliver in time for your vacation. Thanks for a great summary of this camera. 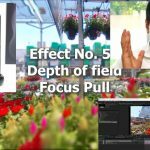 The focus-after-the-fact feature intrigues me and I wonder if the depth function can be used with some AR/VR-ish ideas i have for a short film . Thanks again. A friend of mine who subscribed to the Kickstarter campaign just sent me a link to some recent picture and clip samples taken with the Qoocam and I was surprised to find both the pics and clips are substantially sharper than those from the Mirage. In fact, the clip is the sharpest I have seen from a consumer 3D 180 or 360 camera. Video sync looks much improved over their initial clip samples. But stills sync is not perfect yet as seen in the picture of the peacock where the foot at the left is clearly out of sync. The qoocam only does 3d at 30fps? THat doesn’t make sense because 360 is at 60fps. 3d would just be using a different lens. Not sure why that would cause 3d to have to be at half the framerate of 360 video. It should be the same thing, but just switching to using a different lens. I need 60fps 3d basically. This is what is stopping me from buying just about every 3d product out there. I am shooting synced gopro cams now and its still the best due to the wide range of framerates I can shoot at. I can shoot twin 4k 30fps now, so that’s really 8k 3d. 2.7k per eye gives me the 60fps I need. Nothing is close to this yet. Orangelab makes the gopro sync device. Hi Steve. There is a difference between headset refresh rate and the video rate. Headset refresh rate for decent VR as you know is at least 60 hz (Gear VR). But the video doesn’t have to be more than 30fps or even 24fps. You can watch on youtube any number of 360 videos with 30fps and they won’t make you sick in a VR headset. but if you really want 3D 360 at 60fps, yes it’s doable with cameras such as Kandao Obsidian S (8K 3D @ 50fps), Kandao Obsidian R, Insta360 Pro (4K 3D @ 60fps). Whoops. I just watched your latest video update on the Qoocam and was so excited that I immediately purchased via Indiegogo. Only after I purchased did I realize the very low photo resolution of the product. I had to cancel and refund immediately. It is definitely geared towards video capture. I love the concept of a combo 360 camera and VR180 camera, but the photo resolution is a personal disappointment. I was surprised to hear you say (in your recent hands-on review) that the VR180 footage from the Qoocam appears to be on par with that of the Mirage. I found the zoo clip shot with the Qoocam (downloaded directly from their page) much sharper than any footage I have seen shot from the Mirage. Granted, the footage I saw taken with the Mirage came mostly from YT. But nonetheless, the Qoocam footage turned out to be sharper than most VR content I have yet seen. The video sync (left and right image sync) is also much improved on the zoo clip when compared to the earlier fencing clip where sync errors are obvious. However, as I mentioned in an earlier post, the stills sync remains problematic. I don’t know if they left you a sample of the camera. But if they did, you might want to test stills sync accuracy and report your findings to them. Sync has always been a concern with stereo cameras. Cameras such as UCVR or Lucidcam never even managed good video sync. Excellent product! I have a few questions. When streaming, does the video also being recorded to the SD card? Can you remotely control the camera from a mobile phone? Hi Nathan! Yes you can remotely control the camera from a mobile phone. In the video, you can see Ivy was controlling the camera with her phone wirelessly. I don’t know if live streams are also recorded. Let me find out! If you were to pick between the Rylo and the Qoocam, which one would you go for and why? (Main focus is on the 360 photos and videos). Would be great if you can help me decide between the two! Thanks a lot for your valuable insight! So Rylo it is for me! Great review, thanks for sharing your insights. Have you noticed any issues with the tripod mount not being centered? I had a mount for my Fusion 360 that was slightly offset and had issues seeing the pole at the nadir. Wondering if Qoocam will have the same issues, or if the pole is completely hidden? How would you compare image quality between Qoocam and Fusion 360? And workflow..is Qoocam workflow better than Fusion Studio? I bought Qoocam and recieved it yesterday. Low resolution is a big problem for me. Is there a way to generate depth maps for the 360 images? It seems that the front and back lenses are offset and hence may be possible? Hi Andras. Sorry no the depth map works only for VR180 mode. Thank you for the quick ‘tutorial’ on using AE’s Displacement Map Filter. Regrettably, I have little luck with the depth maps. Edge detection seems to be very week and hence, when applying After Effects’ Displacement Map, for example, even with the slightest (<30) horizontal or vertical displacement values, the image gets cut up and distorted. There have been a few situations where it worked, but mostly not. Hi Andras. The Qoocam is not a true 6DOF camera, so the displacement map effects can only work within a relatively narrow range. You’ll need to use it for more subtle animations to make it convincing, or else the image will look distorted as you noted. This is not so much a Qoocam issue but simply a limitation of depth map technology at the moment. IOW, that’s all we can do at this point, unless you have an actual 3D model from videogrammetry or 3D scanning. 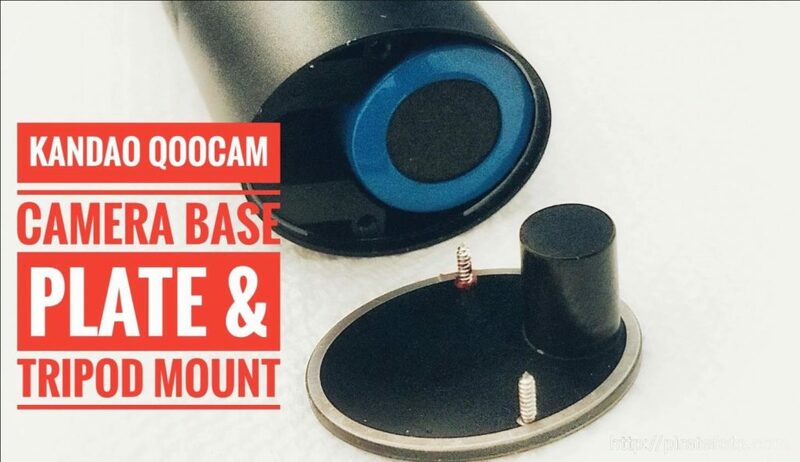 Mike, The Qoocam Facebook page has many examples of the tripod mount failing, this seems to be a significant design failing, I think you need to report this in your review. While there have been a statistically small number of mishaps, the company has taken steps already to own the newly discovered issue and address the it on multiple channels. They are also offering to have the faulty units replaced at no charge. Please keep in mind, this is a brand new product, and those who have it hand must (and do) understand these risks when they support the development of a brand new product from scratch. Overall, it is a truly innovative camera which has a highly capable team behind it; one that has also has shown their hard work in the development of the supporting software. I applaud them. don’t really understand why they didn’t add a 4th lens to give a real 3d 360 camera. Vr180 is a good idea but for few bucks more you would get vr360 3d and of course also vr180 3d letting the choice to the photographer witch one he want. I gather they did not want to appear to be stealing the concept from TwoEyes VR which offers exactly that. You can´t just add a 4th camera… You would have front 3D, back 3D, but no 3D when you look to any sides, as there will be no displacement between the “eyes”. To have real 360 3D you need at least 6 cameras. The ideal woube be 8, as vuze. Which android phones are compatible with the qoocam. I have emailed kandao service and sales and not had any reply. There is a small list on their help page but it also says android 6.0 and above . Received the Qoocam 11/09/2018. Upgraded the firmware and have been testing it for the last few days. I got this to record 180 4k 60fps video for Oculus Go playback. 180 3D at 1920×1920 looks horrible. Hope it’s just my unit that is defective. Will be calling support before returning the unit. Hi Miguel. They already shipped to Kickstarter backers a long time ago. I suggest you contact Qoocam to get the tracking number. I’m considering buying one of these cameras, but do not have a Windows or Mac PC. Any idea if there is a Linux version of the desktop software? If not, is it still worth the money working only with the mobile app? No there is no Linux version of the desktop software. If you don’t have the desktop app but the smartphone app works on your phone, I think the Qoocam is ok. It will just take longer to export photos and videos. And I’m not sure of any 360 camera with Linux compatibility. FWIW, there are cameras with in-camera stitching such as the Penguin360, or the Lenovo Mirage. Can import image upload 3d photo facebook ?